How to fill in the blanks on the birthday party invitation, rsvp help, wording for birthday invitations and help for filling out a birthday invitation. RSVP advice and how to deal with sticky birthday party situations. After choosing a birthday party invitation here are some ideas on how to fill in the blanks. Most of the invitation is straight forward ... but there are a few tricky parts. We've included how to fill out the RSVP, how to keep siblings from attending, asking parents to stay - or NOT to stay - for the party, how to request that guests don't bring presents, how to ask guests to pay for their food or admission, how to ask them to donate to your charity and is it okay to ask for money or gift cards. First the easy part - what details to include in your party invitation. Place - Your house address or location of the party place. Hint - It is always good to draw a map on the back of the invitation or include one on a separate piece of paper. For- Include the child’s name and how old they are going to be. Example: Sally's 8th birthday celebration! RSVP - Include parents names, phone number and an email address on the invitation RSVP line. Some parents are shy about calling other parents or too busy to pick up the phone, but they will take the time to email. The RSVP used to mean please let us know if you will not attend. It is a very important piece of party planning information - as any party planner knows. But today many people either overlook the RSVP or don't know what it means so they don't respond. A good way around the RSVP is to let guests know how you want them to respond. "Please let us know if you are coming so we can prepare enough food." "Please call and let us know if you are attending so we can tell (name of place) how many to expect." "Please respond by _(date)_____ so we can expect you." There will most likely be a few that will show up without calling. Always prepare for 2 - 3 more guests then have called to tell you they will attend. 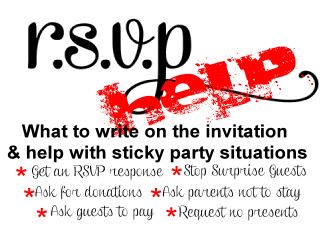 For more RSVP help see our RSVP meaning page for advice on how to get guests to respond to your party invitation. Any information that the child needs to know before they arrive at the party should be included in the invitation. How to dress - if it is a costume or dress up party give a clear description of the theme and give examples of how to create the look you want. Meal or No Meal - Let the parents and guests know if you will be serving lunch or dinner at the party. Including what type of food you will be having will alert parents of possible food allergies. What to bring - (swimsuit, sleeping bag, pillow, old clothes if you are going to do a painting craft). If you will be going to dinner, the movies, the mall .... anywhere other then your house make sure and include it on the invitation. Parents will want to know where their kids are going to be during the party. Keeping uninvited siblings from attending the party is easier to do on the invitation before they show up at your doorstep. Sometimes parents think it is okay to send along siblings with the invited guest with or without warning. If this hasn’t happened to you yet … just wait. Suddenly there will be a 4 year old sister who has shown up for your tween daughters spa party. It is much easier to make it clear on the invitation then to say no when they are on the doorstep excited about the party. “We are sorry, but due to the theme of the party we can not accommodate siblings”. When you want to encourage parents to stay for the party there are several different ways to convey this on your invitation. One of the best ways is to provide a separate table of refreshments just for adults. Address the invitation to both the parent and the child. "We would be honored if you both attended ______________ birthday party." "We can't wait to see you both!" "Parents are welcome to attend." "Parents are encouraged to stay." If having extra parents around is not in the plan then add "Please pick up your child at 4:00 PM" to the invitation. If your party will be held at a restaurant or other venue and guests will be required to pay for their food or admission then add the price on the invitation. "Admission price to the zoo is $6.50 for adults and $3.00 for kids if you and the birthday guests' siblings would like to join us". "We've got great seats for the Ranger Game. Hotdogs, Soda and Nachos are $1.50 each at the concession stand." "Each birthday guest will receive 25 tokens! Additional tokens are $5.00 / 25 tokens." "The gift of your presence is enough. Please no gifts." If you are asking for donations to a charity instead of a present - include an information sheet about the charity to the invitation and give details on how they can contribute if they want. "Instead of a gift ______________ (birthday child) has asked that a donation be made to the American Cancer Society." "Please bring canned food items for the local food pantry instead of a gift." "__________ (birthday child's name) wants to help the local Animal Shelter for her birthday. Please help her by bringing any of the following items to the party instead of a birthday gift. Gently used blankets, towels, canned or bagged dog and cat food, leashes, collars or pet toys." Asking for certain gifts, gift cards, money or telling guests where you are registeredis considered socially incorrect on the birthday invitation. If guests call you requesting suggestions then it is okay to tell them what you prefer. "For some ideas on what _________ (birthday child's name) would love for his birthday we've made it easy by registering at Toys R Us."